Over the years I’ve either studied, worked or lived in Salford and have seen Salford Quays evolve from just a piece of wasteland in the mid-90s to a media city in 2013. So it’s about time I wrote about the place. One of the more bizarre facts about Salford is the fact it doesn’t have a city centre, despite it being classed as a city. I’ve been having a good ponder about this and have come to the conclusion Salford Quays is about the closest Salford has to a city centre. I’m certainly not classing Salford Precinct as the centre of Salford, despite its starring role in the 2011 riots. Whilst Swinton is considered Salford’s Civic Centre, it just hasn’t got that city centre vibe. Getting to the Quays is fairly straightforward – turn off the M602 and follow the signs. However I normally scoot into the Quays down Langworthy Road as it’s quicker and has less traffic. The traffic can be a nightmare at rush hour or when United are playing. Manchester United’s ground is just over the water in Trafford, so parking can be a real problem on match days. You can also get a tram to Media City from Manchester city centre, but I think the 50 bus maybe a little faster. The trams go incredibly slow through Salford Quays as there are some really sharp bends. There is hardly any on road parking at Salford Quays. It’s either multi-storey car parks or resident only car park at the nearby apartment developments. You could park up by Broadway, but I would be worried about my car getting nicked or damaged. Salford Quays is next to Ordsall (pronounced ‘Oddsall’), one of the most deprived areas in Salford, and crime is unfortunately one of the valid career options for residents. I used to visit a project there and had to park in a certain place as the Nuns had arrangements with the locals to not nick the cars parked there. Also morning meetings were a must as it was really quiet at that time. 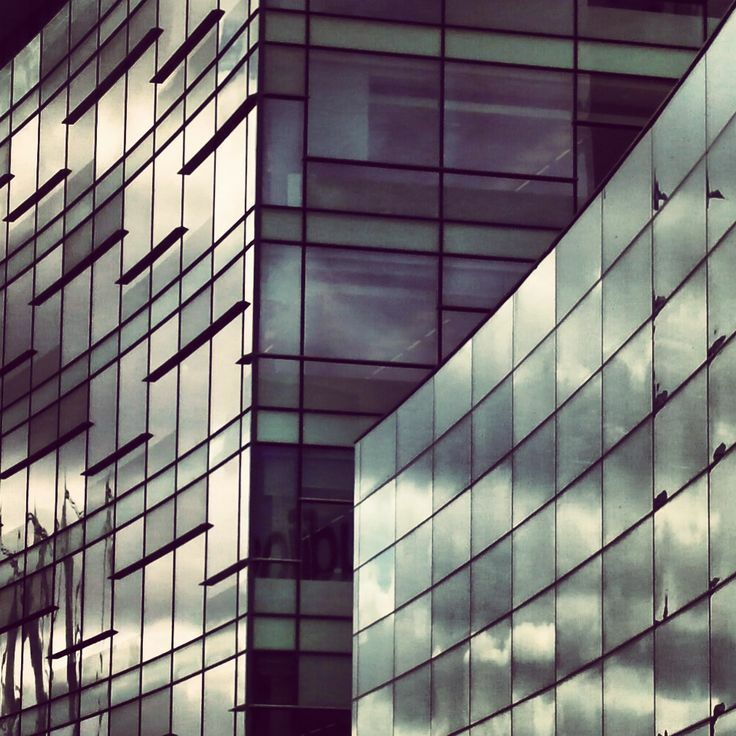 Back to the Quays – one of the best things about the Quays is the buildings. As there was nothing of note before, Salford Quays has become an architect’s playground. 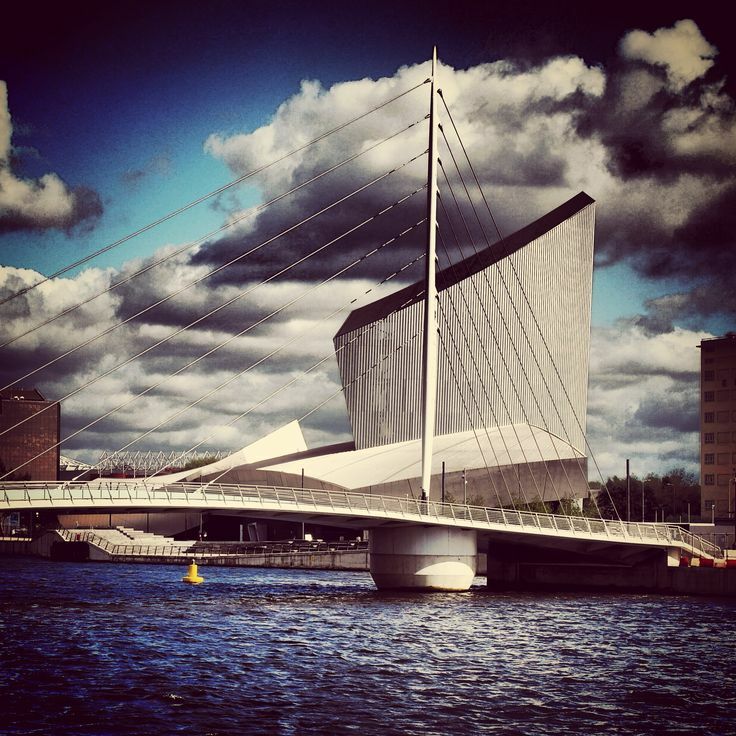 The first to arise from the banks of the Quays was the Lowry Theatre. This is my favourite theatre ever: it has three performance spaces – the Lyric, the Quays and the Studio. There’s also an art gallery dedicated to the works of LS Lowry, a restaurant, café, bars, gift shop and tourist information centre. The sightlines are brilliant within the theatre, the seats are modern and spacious, the building has intuitive design and there are no stairs, just slopping walkways so it’s perfect for people with mobility issues. The interior is painted in a purple and orange, whilst not your standard colour-scheme for a theatre it gives the place a warm atmosphere. Outside the theatre is silver-grey like a ship that has come in to dock. I thought they were crazy building a theatre on the banks of the Quays back in the late 90s, but the culture-led regeneration has transformed this area. Without this and the subsequent developments the BBC would not have moved large chunks of its operation to Media City. Another building of note is the Imperial War Museum North on the opposite bank of the Quays in Trafford. 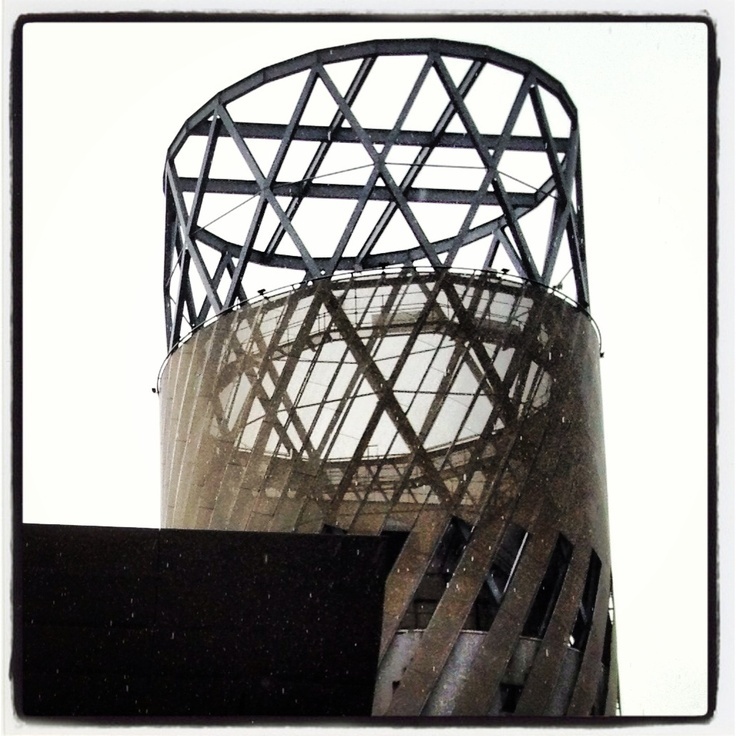 This is not only a visually stunning building, but also a really good and touching museum. I never leave here without crying at one of the exhibitions. So always bring tissues with you. Media City is the newest addition to the Quays. Whilst the buildings aren’t as visually stunning as the Lowry and the Imperial War Museum, they are lovely buildings of glass and steel. I’ve had the opportunity to go into a couple of these buildings and they are serene, ultra-modern buildings designed impeccably to meet the needs of the BBC. There is even a piazza where the BBC can hold events. We went to a 6-Music road show there and it was good despite the weather. There is a shopping mall at Salford Quays called the Lowry Outlet. This is where you will find the main car park. If you spend over £5 you can get your parking validated and get about 4 hours free parking. It’s not the most exciting retail experience here. They focus on having discount outlets for high street shops. There are some specialist shops like Black and Decker store and art/craft shops that cater for homemade card makers. I always go to the Gap outlet for jeans and the Nike shop for trainers as you can get good discounts. My Mum likes the Marks and Spencer’s outlet, whilst Neil is a massive fan of the Cadbury’s shop as it does big bags of mis-shapes along with the regular stock. At Christmas time there are some pop up shops, so it’s always good to pop along then to pick up presents. Although if you are a fan of Molton Brown, there is a shop all the year round selling discounted stock. There is also the Red Cinema too on the first floor if you want to take a break from shopping. There is a food court there too, but apart from one stall, you do struggle to get some healthy food. I found the Chicken Cottage to be the spicier version of KFC, which was a pleasant surprise. There are a couple of coffee shops in the Lowry outlet – a Costa which is always packed and the independent one upstairs that used to be a Coffee Republic. However I prefer to pop to the Costa over at Media City as it’s quieter and you can watch the glamorous world of the BBC walk on by. Over on the Media City side there is an outdoor bar, some restaurants and a Booths Supermarket. Booths Supermarket is well posh. It has that Waitrose serene shopping vibe going on. Whilst it’s not that big, you can really indulge in really nice food you can’t normally get in Tesco or Asda. On the restaurant front there is a Wagamama Japanese restaurant here. It has to be the best one we’ve been to and on the evening we went it was packed. They have updated the menu and their firecracker chicken is ace. There are other restaurants here, at the outlet and on the edge of the Quays like Frankie and Bennies, Prezzo and Lime. It’s handy if you want a pre-theatre meal or are going to one of the BBC filming events e.g. A Question of Sport and Mastermind. I do recommend you sign up for the BBC audience events, as we got extremely lucky and saw the Pet Shop Boys play with the BBC Philharmonic Orchestra for free. It’s strange but true but you can also swim, wakeboard and windsurf in Salford Quays. You can do all this at the unfortunately named Watersports Centre. They do a lot of open water swimming in the Quays, not my idea of fun, but great for those who do triathlons or charity swims. I can’t express how extreme the transformation has been to Salford Quays over the past twenty years. 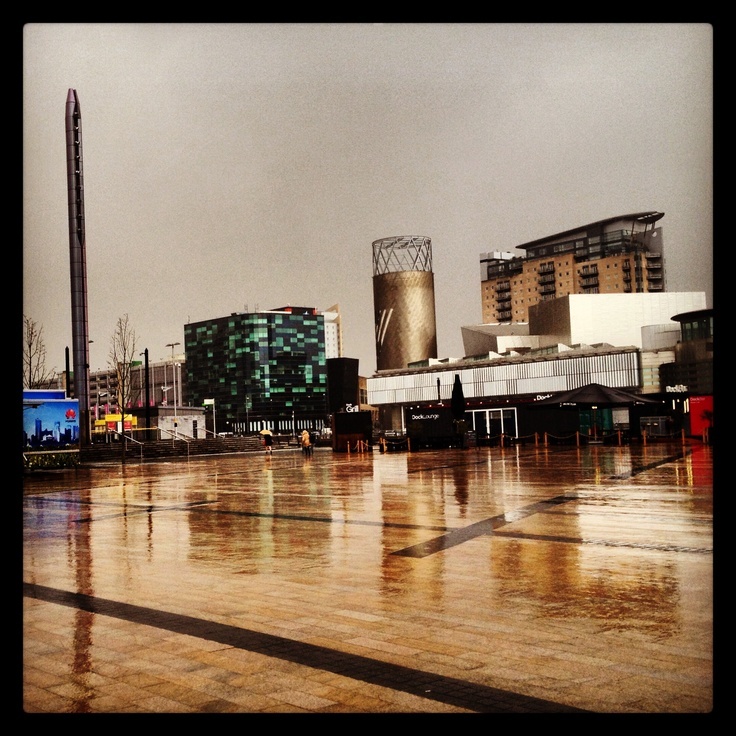 What was literally a wasteland in 1994 where I made student films is now a thriving Media City. Without the Lowry Theatre and the cultural regeneration it triggered this simply would not have happened. It’s well worth popping down and having a nosey, although bring a jacket as it’s always windy here.